Drive belts are a critical piece of your motorcycle and should be inspected on regular intervals. We recommend checking your belt more often if you end up on a dirt of gravel road. How often should you replace it? Approximately 70k-75k miles. How often should you inspect it? Weekly, or every time you ride on a dirt or gravel road. One rock caught in your sprocket can damage your belt in up to 30 locations in as little as 20 miles. Why do you use the brand you use? Cycra High Strength Final Drive Belts (a team of S&S and Gates). Gates has always made the best belts of any kind and S&S is known across the industry as the best name in performance parts. 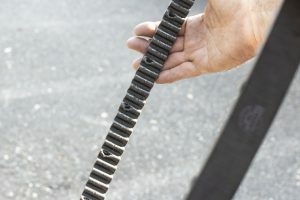 Replacing final drive belts on a HD motorcycle is not a quick job and having one break on a long distance ride can ruin a vacation or a group ride for many.